There are times throughout the year when getting together with family is much anticipated. Father’s Day is one of those days! With the day quickly approaching, finding places to celebrate dad and all he’s done for you, may be difficult. 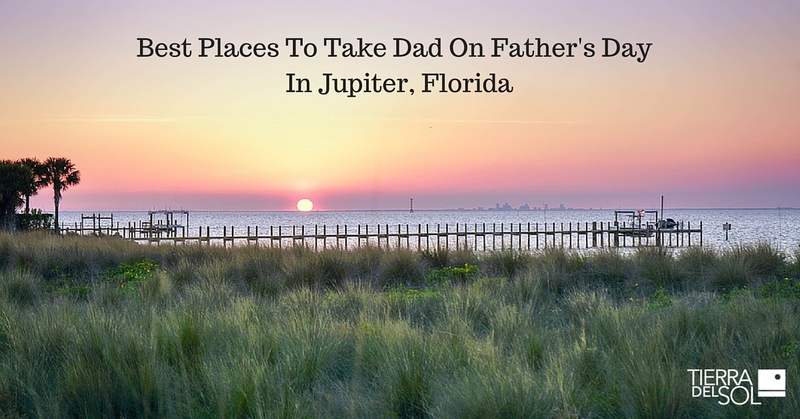 Here is a list of some of the best places to take dad on Father’s Day in Jupiter, Florida. One place you can start the day off with a bang is at Berry Fresh Café. If you are from the Jupiter, Florida area likely you have heard of this café. They are famous for their blueberry fritters and lemon ricotta pancakes. Of course they also offer a great selection of coffees. If you want to start dad off with a good morning meal, this is a great place to take him to. It can fuel you both to head out to the next event—especially if it’s an outdoor and active one! If your dad loves to golf, why not take him on a trip to the premier golf locations around Jupiter. There’s The Golf Club, Jupiter Dunes Golf Club and Abacoa Golf Club. Regardless of which one you pick, you can offer dad a great day of outdoor fun. Remember that all of the options have great golfing fun, and also great restaurant options. You can take a respite from golf to treat dad to a meal. If you are looking for a separate dining experience, you can always take dad to The Nook. It’s known as a small eclectic “hole in the wall” of an establishment, but it has fantastic meal choices. If you need a full dinner option though, consider JB’s On The Beach or Oceans 234. Either restaurant offers some of the best seafood in the city. Whether dad is a crab lover or a fish connoisseur, either restaurant will be a great and affordable option. If you want to keep things simple, Jupiter Florida has great weather so why not enjoy a simple picnic? Plan on gathering a full menu of cold cuts, cheese, soda, beer and a grill. There are plenty of parks to have you event. In fact, there are 13 local parks where picnic grounds are available. One particular area favorite is Okeeheelee Park. Not only does it have picnic grounds, water and a beautiful lake, but it also has bike paths and trails. You can give dad a great meal and to get active. Active dads may like a visit to Savannas Preserve State Park or Riverbend Park. There is the normal bike trial and hiking trail, but it has more outdoor fun. Father’s Day may be perfect for the active dad who wants to kayak or canoe. Both are great options that will let you bond. If you don’t want to travel too far, try visiting Jupiter Outdoor Center. It is the perfect spot to soak up the Florida sun, burn some calories and bond with dad. At the center you can rent kayaks, stand-up paddle-boards, go on snorkeling tours or visit historic sites like the Jupiter Inlet Lighthouse. This is a great place to take dad if you want to get outside with dad this Father’s Day. Finally, another notable option for dad this Father’s Day is Nick’s Tomato Pie. It’s an official Italian cuisine restaurant. If your dad loves pasta, great wine and family-style ambiance, this could be the perfect location to spend dinner time with him. Be sure to make reservations for the date, but then enjoy a delicious dinner. Don’t forget the dessert too! Usually combining events is the best option for Father’s Day. Start the afternoon off at a great café, take dad to a nice event, have dinner and close off the night on the water. Whatever you do, you are going to find plenty of places to enjoy this day with your dad and show him just how special he is.